In their revised model of the collapse of the ancient Maya, social scientists B.L. "Billie" Turner and Jeremy "Jerry" A. Sabloff provide an up-to-date, human-environment systems theory in which they put together the degree of environmental and economic stress in the area that served as a trigger or tipping point for the Central Maya Lowlands. The co-authors described the Classic Period of the Lowland Maya (CE 300-800) as a "highly complex civilization organized into networks of city-states," in their perspective article published Aug. 21 in the online Early Edition of the Proceedings of the National Academy of Sciences. Previous to the collapse, the Maya occupied the area for more than 2,000 years, noted the authors, "a time in which they developed a sophisticated understanding of their environment, built and sustained intensive production [and water] systems, and withstood at least two long-term episodes of aridity." They document the human-environment interactions that were severely stressed during the 9th century arid phase. "This environmental stress was complemented by a shift in commercial trade from across the peninsula to around it, which reduced the economy of the ruling elite to keep up the livelihood infrastructure to prevent the tipping point," said Turner, a Distinguished Sustainability Scientist with the Global Institute of Sustainability at Arizona State University. "The decision was made to vacate the central lowlands rather than maintain the investment. This theory is not only consistent with the data on collapse but on the failure of the central lowlands to be reoccupied subsequently," said Turner. "It acknowledges the role of climate change and anthropogenic environmental change, while also recognizing the role of commerce and choice," he said. Co-author Sabloff noted that rather than a monolithic period of collapse, there were many variable patterns, which is consistent with the thesis Turner and he advance. "The only way to explain the variability is to take a complex systems view," said Sabloff, president of the Santa Fe Institute. 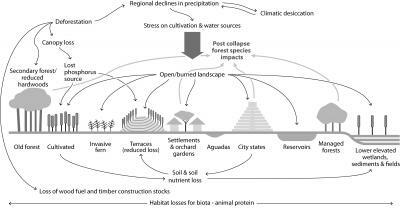 "The Maya case lends insights for the use of paleo- and historical analogs to inform contemporary global environment change and sustainability," wrote the authors. "Balance between the extremes of generalization and context is required. "Climate change, specifically aridity, was an important exogenous forcing on human-environment conditions throughout the Maya Lowlands," they concluded. 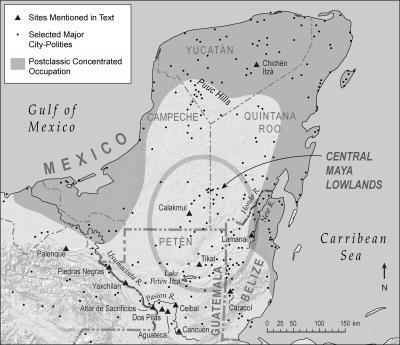 "Complex system interactions generated the collapse and depopulation of the (Central Maya Lowlands) and fostered its long-term abandonment. This lesson — increasingly voiced in the literature — should be heeded in the use of analogs for sustainability science."